If we hope to stem the tide of consumption, then we need to learn how to design and build things that have many uses again. In other words, double- or triple-duty is just the starting point. Today, we’ve not only lost this ability, but now, we have extras of everything instead. It begins at the scale of the neighborhood. Because there’s no neighborhood coffee shop within walking distance, some homes now have a “cafe” in the kitchen, with a cute little awning over the espresso machine. Because there’s no neighborhood cinema, people feel that they need a home theatre. Because there are no parks within a couple blocks, people need big back yards for the kids. But it’s not all the neighborhood’s fault. Secondary bedrooms in many homes sold just before the Meltdown had better-appointed third and fourth bedrooms than master suites a generation before. 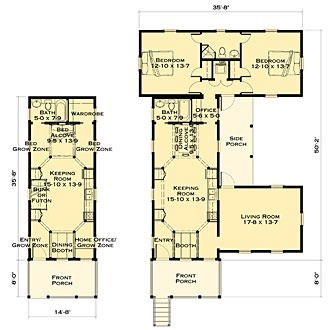 If we were to believe the floor plans, then it was the birthright of every American child to have a walk-in closet and compartmentalized private bath by the time they moved out of the nursery. All these things would be fine if we had unlimited money to buy stuff with and unlimited energy to run that stuff with. But that’s not the case, either on a global scale or on a personal scale, as we have all discovered to varying degrees of pain since the beginning of the Meltdown in October 2008. Double-duty (or more) is not a new idea. Ask your grandparents. The “waste not, want not” ethic was central to nearly every culture around the world less than a century ago. Read Benjamin Franklin and it’s clear that America was founded by people who valued frugality instead of celebrating consumption. I’ve had a recent close encounter with the need for extreme double-duty. I met with Andrés Duany on the Saturday after Hurricane Katrina and we laid out the foundation principles of what would soon come to be known as the Katrina Cottages. The idea was to help people gain a foothold on their property again by building tiny cottages that were appropriate to the architectural needs of the region, excellent in design, and deliverable by all major construction methods: site-built, panelized, modular, and manufactured. 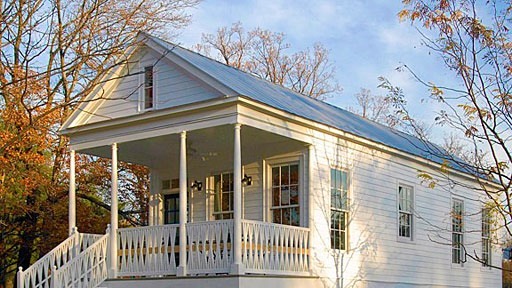 I put out a call to the New Urban Guild for Katrina Cottage designs. 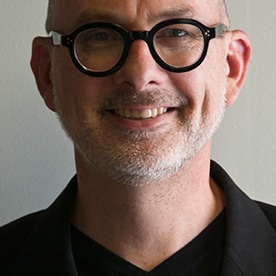 Andrés, his partner Elizabeth Plater-Zyberk, and the Congress for the New Urbanism orchestrated the largest planning event in human history (the Mississippi Renewal Forum) on the Gulf Coast just six weeks after the hurricane, with nearly 200 planners, architects, and other professionals participating. 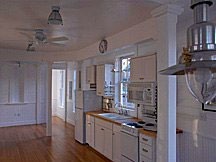 But even before that event, nearly two dozen Katrina Cottages had been designed by Erika Albright, Bill Allison, Bill Dennis, Victor Deupi, Frank Greene, Gary Justiss, Alex Latham, Matt Lister, Tom Low, Eric Moser, Dan Osborne, Julie Sanford, Laura Welsh, and myself. All work was done for free, of course. During the Forum, several more Katrina Cottages were designed, including the little yellow one by Marianne Cusato that has since received a great deal of press. Since the Forum, still others have been designed by an expanding circle of architects and designers. One of the biggest lessons we learned is that you can’t just shrink a house and expect people to like it. If you take away size, you’ve gotta give something else in return. Ask someone to move into a cottage half the size of their current house, and they’ll likely turn you down. But if the cottage lives twice as big as its footage, then that’s a different story. This is an idea I call the Smaller & Smarter Cottage, and it has other benefits, too. In order to be Smaller & Smarter, the cottage has to be able to store a lot more stuff per foot than the bigger house, but the entire floor plan can’t be just one big closet; everything has to be rethought. We even carve into the walls themselves, leaving no cubic inch unused. Why shouldn’t interior walls be used for shelving, rather than just wasted? The side-benefit to this is the fact that the storage methods (such as shelving walls) that are visible can be quite attractive, and contribute mightily to the cottage’s charm. There was another problem, too: the first generation of Katrina Cottages didn’t expand very well. This is because in a tiny cottage, the exterior walls quickly get taken up with things that are difficult to move, like kitchen cabinets, bathrooms, and closets. So we developed a new type of Katrina Cottage: the Kernel Cottage. Kernel Cottage I is the plan on the left below. To the right, you can see one of the many ways it can expand. The second generation of Katrina are called “kernel cottages” because, like a seed, they are designed to grow easily in many directions. People can buy a smaller cottage today than they’ll need in the future if the path to expansion is obvious. Before home mortgages, everyone built this way. Thomas Jefferson lived in one of the little garden pavilions on the back side of Monticello for several years while he was building the main house. If Jefferson could do it, why can’t we? Interestingly, one of the things people enjoy most about the character of pre-mortgage houses is the story they tell in the incremental way they have grown from one generation to the next. But it wasn’t designed that way from the beginning, as we might suppose today. Rather, it’s the character that emerged from many hands working over time. Beyond the obvious savings in building materials, there’s a huge, three-pronged sustainability bonus that comes from building much smaller to begin with, then adding on later: First, because the square footage is a lot less, it costs much less to condition. Second, because rooms in tiny cottages are likely to have windows on both sides, they cross-ventilate wonderfully in summer, and also daylight beautifully. This saves even more in conditioning expense. Finally, if the designer really does their job and the cottage lives much larger than its footage, people might just discover that they don’t need to add such a big addition when it comes time to expand. 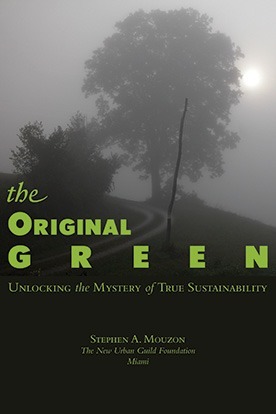 This post is part of the serialization of the second chapter of the Original Green [Unlocking the Mystery of True Sustainability]. The chapter is entitled “What Can We Do?” It describes principles upon which real sustainability can be based. This post is #6 in the top 10 items we can do. I have a nice design of a house i want to build in southern california. It is made with structural insulated panels which are put together in a couple of days. I have some images on the internet that were posted to show my design. I am a retired man with modern CAD training. I use SolidWorks in all of my design. It works well because once a wall has been designed, it can be used for another home just with a click of a mouse. I do have all of the modern CAD programs on my computer; but I like SolidWorks best because it fits well with my mechanical ability. Let me know if we can communicate to come up with disaster housing even for California should the "big one" hit the area. I could volunteer my services.